Michigan hospital emergency rooms and urgent care centers are seeing patients who’ve been injured during this cold snap. Dr. Scott Lazzara is an urgent care physician at McLaren Greater Lansing. He says he’s seen a lot of slip and falls. “We’re seeing a lot of people who are falling, breaking their wrist, hurting their back, spraining their ankles,” says Lazzara. Lazzara says people are so bundled up to fight the cold their vision is impaired and they're less able to avoid slipping and falling. “People get so clothed up that they can’t move … and then they slip and that’s when they hurt themselves,” says Lazzara. Lazzara says plunging temperatures are also putting Michiganders at risk for frostbite and other cold-related health issues. This time the forecasters did not cry wolf. We got slammed by snow. Now that the snow has fallen, we’re looking at winds and dangerous cold. What's ahead and when will we see something resembling a more "typical" Michigan winter? For the answers we turned to MLive meteorologist Mark Torregrossa, who also runs farmerweather.com. I just got back yesterday from nearly two weeks in Ireland, and we were checking on Torregrossa’s reports as we got ready to fly back yesterday -- wondering if we were going to beat the snow and be able to land. The answer was "yes." He was spot-on in calling what was going to happen and when. As Michigan descends into an arctic freeze, many cities and towns are struggling to clean up after Sunday’s big snowstorm. “It’s just too dangerous for city residents to be outdoors,” Lansing Mayor Virg Bernero told reporters at a news conference today. 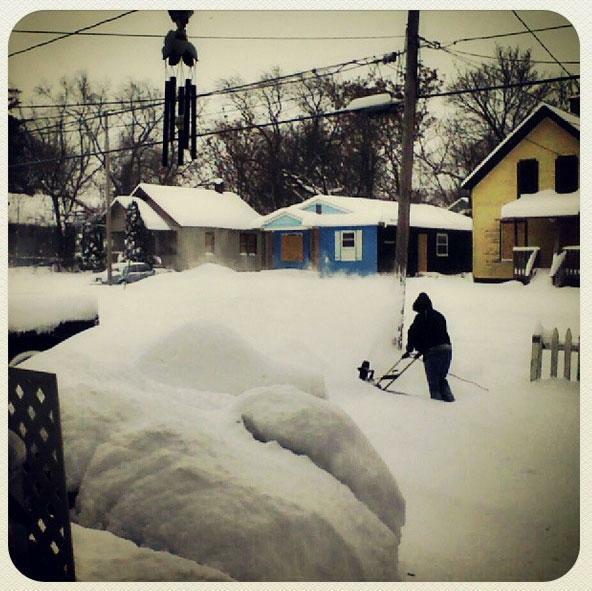 People are digging out from the snowstorm in much of Michigan today. So did this snowstorm break records in Michigan? In Detroit, 10.6 inches fell during the storm, not enough to crack the top-10 list for snowstorms in this area. Here are the biggest snowfalls recorded in the Detroit area according to the National Weather Service. Most of these storms occurred prior to 1930. LANSING, Mich. (AP) - Gov. Rick Snyder says Michigan has put out every available road crew and has increased state police patrols in response to the heavy snowfall and the deep freeze forecast to follow it. Snyder says Michigan residents can help, too, by looking in on friends and neighbors while staying off roads as much as possible. A foot of snow was on the ground already by Sunday evening in parts of the Lower Peninsula, with more on the way.